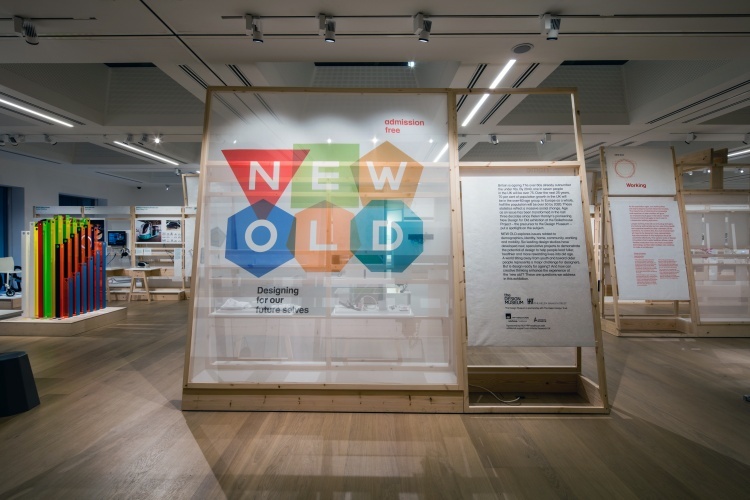 The Design Museum’s latest temporary exhibition – curated by Jeremy Myerson – examines design solutions for an ageing population, with themes ranging from community to identity. In 1986 philanthropist Helen Hamlyn launched an exhibition called New Design for Old, which explored how everyday objects could be better shaped for an ageing population. 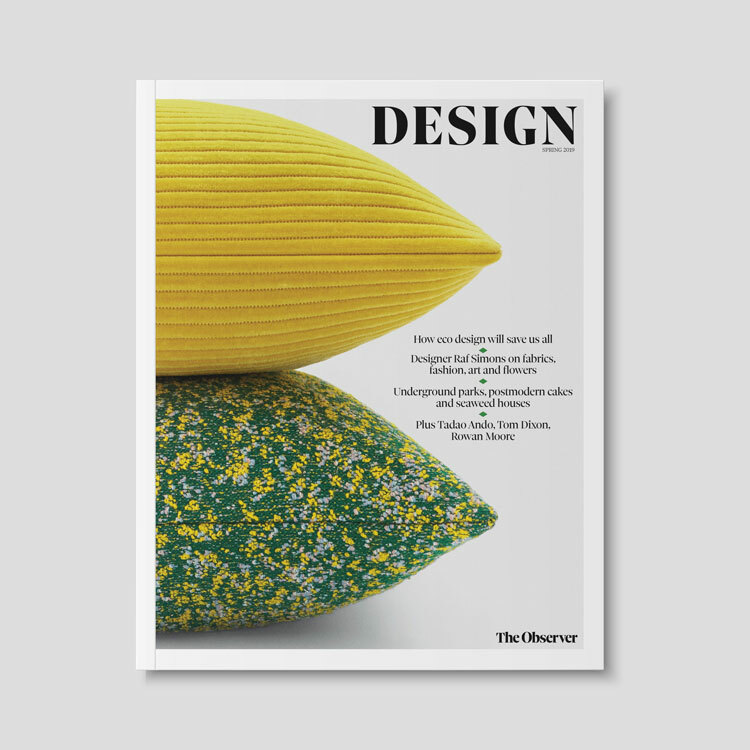 Housed in Terence Conran’s Boilerhouse Project – the precursor to the Design Museum – the exhibition sought design solutions for often overlooked factors associated with ageing, such as reduced agility, stamina and eyesight. Thirty years later, with a rapidly ageing population that already sees those aged over 60 outnumber under 16s in the UK, the questions surrounding the subject have never been more relevant. Over the next 25 years, 70% of our population will make up the over-60 age group, while in Europe as a whole, half the population will be over 50 by 2020, according to research highlighted in the book published to accompany the exhibition. 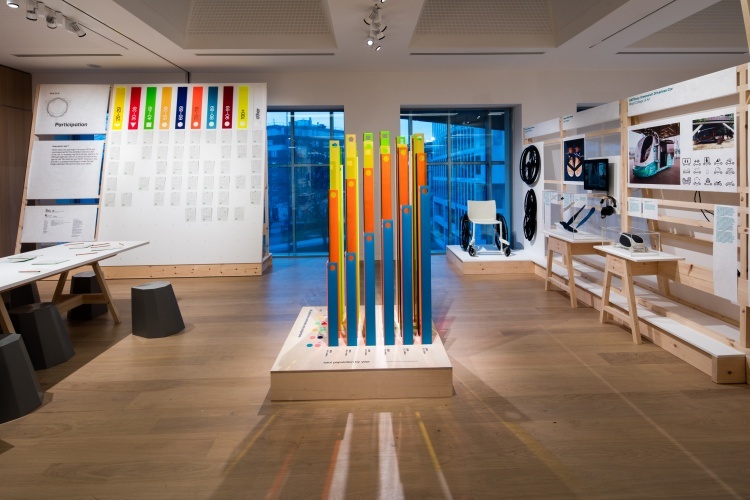 To coincide with the 30th anniversary of Hamlyn’s original exhibition, the Royal College of Art’s first holder of the Helen Hamlyn chair of design role, Jeremy Myerson, has curated a temporary exhibition at the Design Museum’s new home in Kensington, London. New Old: Designing for our Future Selves looks to ask – and hopefully answer – many of the same questions first raised by Hamlyn 30 years ago, largely exploring how design can help people in an ageing society lead happier and healthier lives, as well as reducing the stigma often attached to age. These questions are examined in the exhibition through a series of different themes, including demographic, identity, community, home, work and mobility. Each section is divided up to reflect these themes and features a range of concepts, products and technologies, with one special design commission per theme based on a particular brief. 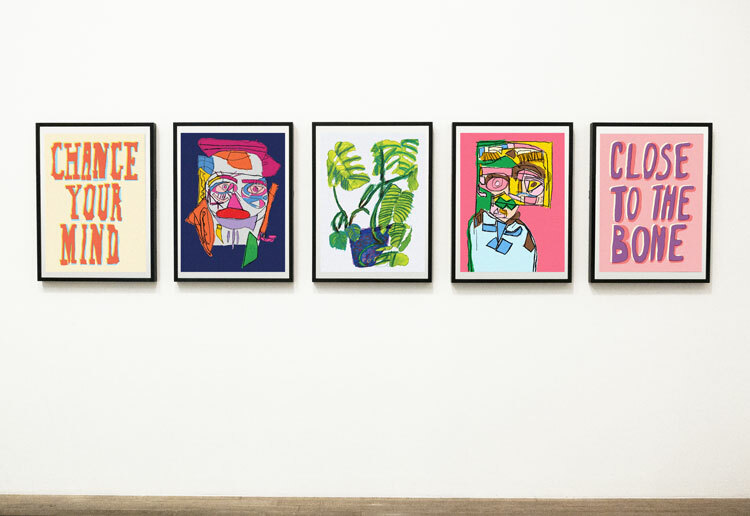 On entering the exhibition – and before experiencing some of the solutions on display – visitors are asked to take a step back and examine their own perception of what age means, and their attitudes towards it. 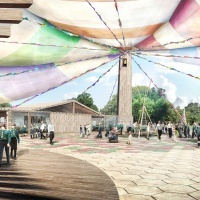 The centrepiece of this section is a brightly coloured perspex installation which takes the form of a giant bar graph, visually representing the UK’s population estimates and projections by age group. Visitors are asked to take part by filling in a postcard answering the question “I think old age starts at…”, and hanging it underneath the indicated age range on the wall. The rest of the exhibition is more pared back; the simple wooden structures and white paper backdrops with short pieces of accompanying text allow the exhibits to do the majority of the talking themselves. 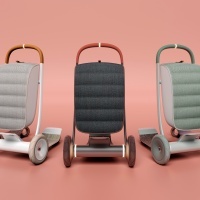 In the “Mobility” section, a selection of designs on show address not only the practical elements of getting around as we get older, but also the opportunities for enhancing social connections and overall wellbeing. 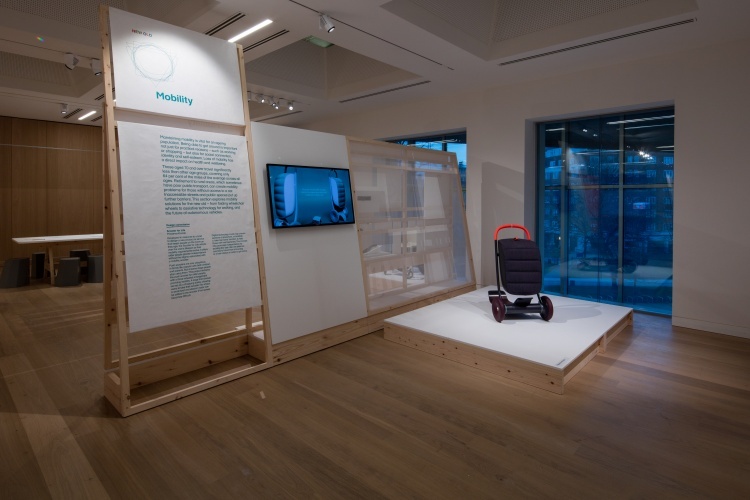 Aside from existing concepts, ranging from Lisa Pape’s assistive technology for walking, to “the world’s first foldable wheelchair wheel”, designed by Duncan Fitzsimons, consultancy PriestmanGoode has also been commissioned to develop a new product or service that “keeps people on the move in older age”. The consultancy’s prototype takes the form of a Scooter for Life – a partly power-assisted, standing scooter that can also be adapted to be used as a seated mobility scooter instead. It features a number of well-thought out features, such a “take me home” function, as well the ability to detect and learn about different surfaces, changing its direction and speed accordingly. 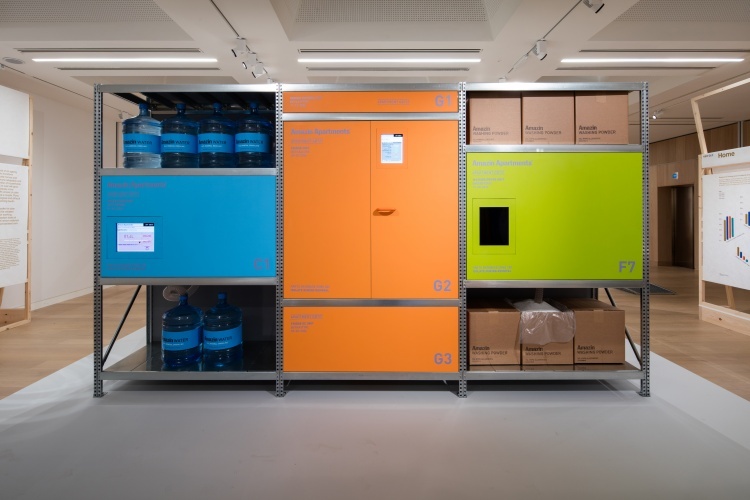 While only existing as a prototype in its current form, encouragingly PriestmanGoode says it is seeking manufacturers to get the product out into an international market, serving to reinforce the exhibition’s overarching aim of finding real, lasting solutions to the age question. Other highlights include Future Facility’s Amazin Apartments concept, which sees a futuristic “double-sided”, serviced apartment dominate the “Home” section of the exhibition space. One side of apartment concept is for the resident, and features smart appliances and technology such as washing machines built into the walls. The other side houses a network of hidden corridors which allow the resident’s fridge to be replenished with food, repairs made to appliances and heating and air conditioning to be maintained continually, without causing undue intrusion and anxiety for them. 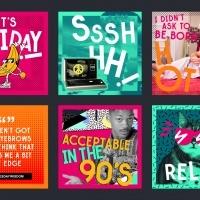 In a slightly different approach to automating our lives through technology, Ideo’s artificial intelligence system – commissioned to tie in with the “Community” theme – envisages how it could be used to enhance social interaction for older people. In a more advanced vision of current AI assistant technology, “Spirit” is the user’s constant companion, and has access to every element of their lives. This ranges from who they speak to and what they read to what they eat and drink, and even how they respond to people physically and emotionally, thanks to a group of tiny biosensors inserted into the user’s body. Based on this accumulated data, Spirit’s in-built algorithm analyses all of it to build a detailed profile of who it is caring for, and recommends potential friends or co-workers to meet up with who it predicts would be “good” for them. Although the prospect of giving over every element of ourselves to a robot may sound like a slightly terrifying dystopian vision of the future for many, with Spirit Ideo is tapping into the way that this sort of technology is already heading. 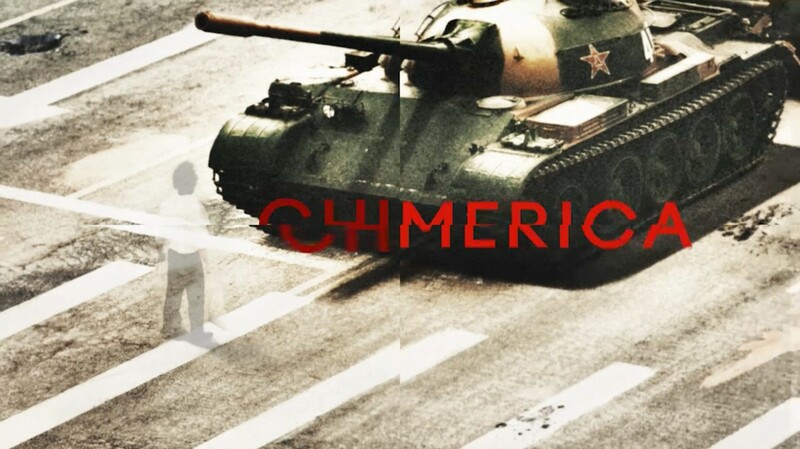 It demonstrates how society can use the technologies of tomorrow as a way to “augment, rather than automate away” the human experience, according to its creators. Finally, tucked into the corner of the space is Special Projects’ interpretation of “Identity”, which takes the form of a living installation called Exchange. Designed to be a warm, inviting environment, the installation features a lounge-style set up surrounded by lots of greenery. 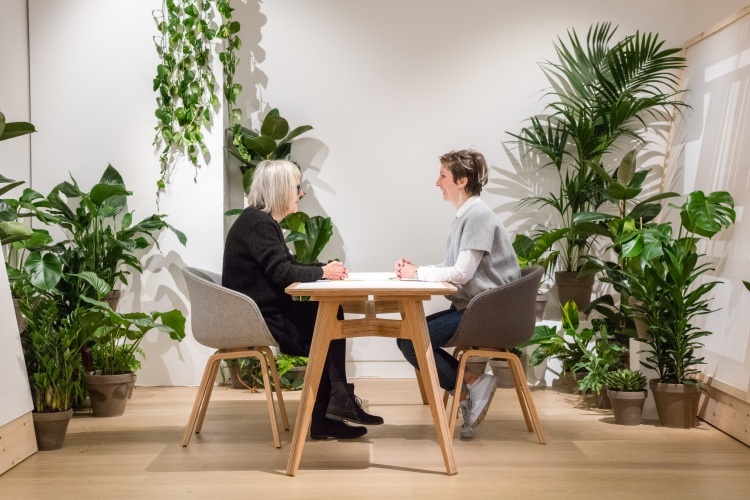 Taking a seat at the table in the middle of the space – designed as an “oversized notebook” – you come face-to-face with a volunteer from the “New Old” vanguard, and are asked to write down a single question for them to answer, while they do the same in return. In my case, I sit across from a smiling older lady called Ann, who answers my question about her fondest memory with the story of the birth of both of her children, following up by asking about my relationship with technology, and its benefits and negative aspects. 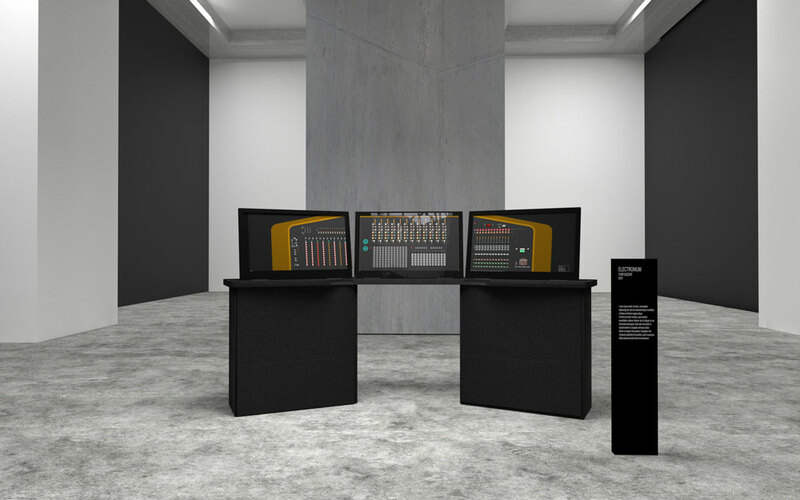 This is a simple but effective device designed to act as a bridge between different generations, and succeeds in momentarily transporting you away from some of the more tech-centric exhibits which dominate the rest of the space. While the technologies seen in New Old demonstrate practical ways of helping people in an ageing society to lead happier and healthier lives, the simplicity of this real life interaction brings the visitor back to the heart of the matter: our attitude towards age. 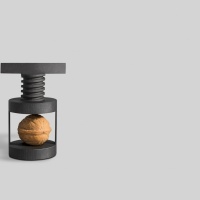 It serves as a reminder that when it comes to finding design solutions to problems, sometimes asking questions is equally as important as answering them. 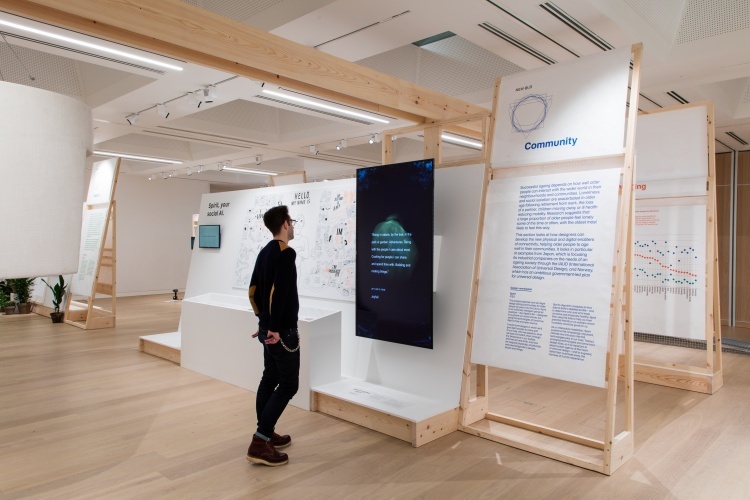 New Old: Designing for our Future Selves will run until 19 February 2017 at the Design Museum, 224-238 Kensington High Street, Kensington, London W8 6AG. Entry is free. For more information, head to the Design Museum’s site. Design in 2017 – what will products look like?